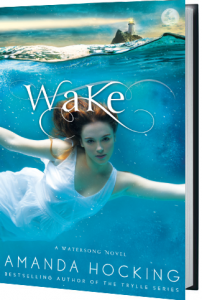 Today Wake is finally out – in hardcover, ebook, and audio book – and I am crazy excited. To celebrate Wake‘s birth, I have not one but TWO giveaways and an fun video that Eric and I did, in which we talk about Wake and the upcoming book tour (which also kicks off today). For all the information on where to get Wake online, click: here. If you physically go to a store, most book stores and major retailers should have it, and if they don’t, ask them to stock it. I talk about the tour in the video, but this is a link to all the tour info: here. If you’re in the are of: the Twin Cities, Chicago, Philadelphia, NYC, Dallas, San Diego, San Francisco, Portland OR, or Seattle, you should definitely check out the tour, because I will be in those places! Now for the giveaways. The first giveaway is for an autographed hardcover of Wake. 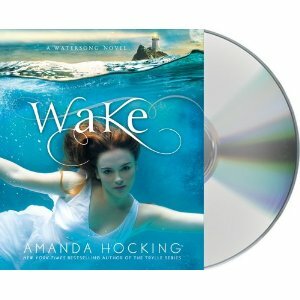 The second giveaway is for an autographed audio version of Wake on CD. It’s neat because Watersong is has music in it, so it’s cool to hear. Enter in the Rafflecopters below. US and Canada only, sorry. The giveaway runs from today until August 14th. Thanks again to everybody for being so supportive and making Wake‘s birthday so awesome! I hope to see you all out on the tour. Can’t wait to read Wake! Thanks for the giveaway! The cover is awesome! I am sure I’m going to love it! Thanks for this great giveaway! I have read reviews that only rave about this book! Thank you so much for the chance to win it!! Awesome! I can’t wait to get Wake! I am so psyched about this book! I have only read the sample on Nook because I am broke and need to wait to get paid to but the whole thing and the anticipation is killing me! I love all of your books (I have read them all…well, at least all of the ones you’ve published) and after seeing the book trailer , I just can’t wait!